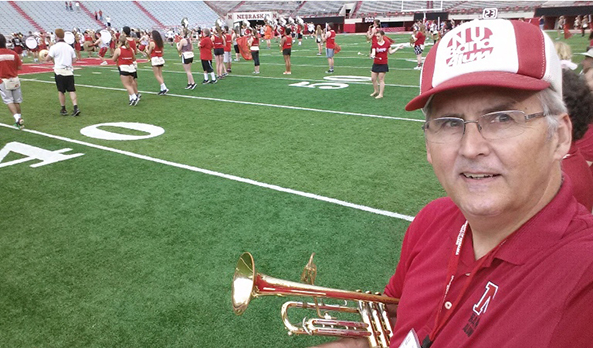 Above: Sen. Robert Clements takes the field at Memorial Stadium as members of the UNL Band Alumni Association prepare to practice with the Cornhusker Marching Band on a game day morning in 2016. To say that newly-appointed Sen. Robert Clements has deep roots in his legislative district would be an understatement. His great-great-grandfather John came to the area in 1868 to homestead as an immigrant from England. He went on to be one of the four men who incorporated the village of Elmwood in 1886. The soft-spoken senator also has deep roots in the banking industry. His grandfather Guy began working in the American Exchange Bank in Elmwood in 1907, when it was owned by author Bess Streeter Aldrich’s family. Members of the Clements family have been involved there ever since, including the senator’s father Dwight, twin brother Richard, son Andrew and nephew Aaron. Clements didn’t get his start at American Exchange, however. After earning his degree in mathematics from the University of Nebraska-Lincoln, he moved to Kansas City. “I wanted to find out if I had enough talent to get a job on my own, and not just based on my last name,” he said. After a successful few years, he decided to move back home. He and wife Peggy – high school sweethearts who’ve now been married for 44 years – had two young children and wanted to raise them in a small town. So Clements joined the family business, eventually becoming the bank’s executive vice president. The couple now has five children and 11 grandchildren, and seemingly all that is important to Clements can be traced back to family. In the fifth grade his uncle taught him to play taps on the bugle. He’s been playing it with the American Legion on Memorial Day ever since. But his love of the trumpet goes back even further, to a much less somber root. The theme song to his favorite childhood television show – “The Lone Ranger” – featured the instrument prominently. “It all goes back to the “William Tell Overture” – the truth comes out,” he laughed. As a trumpeter during his undergraduate years, Clements marched in three Orange Bowl parades and became a charter member of the UNL Alumni Band Association. The alumni band plays once a year at Memorial Stadium, which Clements said continues to be thrilling. Clements’ introduction to life as a senator, however, was less so. He was appointed in February to fill a seat left vacant by the resignation of Sen. Bill Kintner, and had to hit the ground running since the legislative session already had begun. “The first week, I thought to myself, if someone else wants this job, they can have it,” he joked. As a member of the Appropriations Committee, Clements was faced with an “overwhelming” amount of information and the grave responsibility of balancing the state’s budget. It was daunting at first, he said, but the willingness of fellow senators to help was a pleasant surprise. “I truly feel like I was meant to be here, given the way it all worked out,” Clements said.